It’s 1997 and a 17 year old Rebekah Teasdale is just finishing work at a French restaurant in the centre of Birmingham. With 30-odd pounds worth of tips in her bag as she steps out into the cool night air, she fixates on the crowd of people waiting to get into the nearby Que Club. Towering above her in its home of an ornate former Methodist church, she’s passed it night after night, fascinated since she started DJing a year ago. After sampling the city’s house clubs, such as Wobble and Bakers, tonight she’s joining friends to go to Atomic Jam for the first time, not really aware of what to expect. Inside, she’s greeted by a huge amphitheatre, still kitted out with a church organ, mezzanine levels reaching up and up towards a distant ceiling. As she sits down on some steps to listen, though, it’s the music that hits her. Dave Clarke is commanding the main room, cutting and scratching between tracks which are pounding the speakers with an energy and intensity she’s never heard before. There are no vocals, but when a hi-hat drops, the locked-in crowd cheers with rapt delight. Billy Nasty follows, somehow taking everyone into even harder and darker territory. “What music is this?” asks Rebekah, totally mesmerised. The answer, it turns out, is to be her lifelong calling: techno. Twenty-one years later, she’s inspiring a new generation with a similarly uncompromising sound, and hosting a Rinse FM show, running her label Elements — which encompasses music, visuals and soon a clothing line — and playing the world’s biggest events, such as Awakenings. 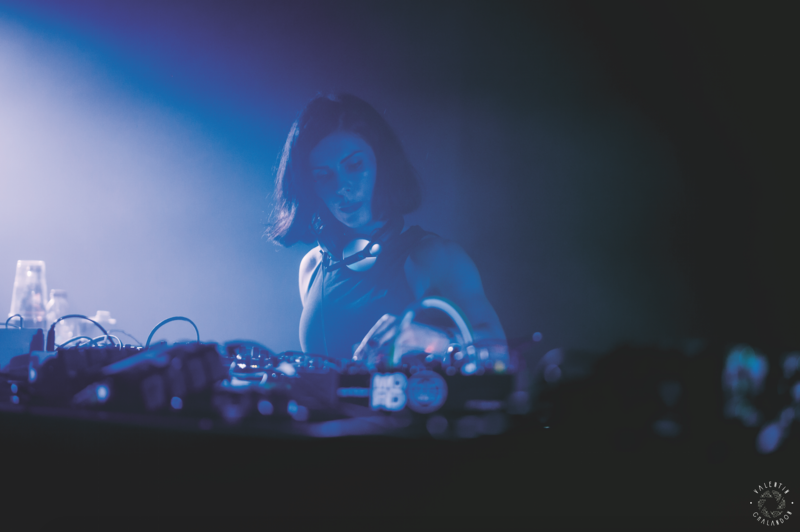 She’s one of the figureheads leading the revival of industrial-strength techno, although her versatile DJ sets often include all manner of grooves, from acid and EBM to electro. Alongside this, she’s established herself as a producer. After returning to college to study production, when her early career was stalling in a haze of partying and frustration at her musical direction, ‘Fear Paralysis’, her 2017 debut album for Soma, showcased a touch for techno’s melding of (wo)man and machine, pouring encoded emotion into an exoskeleton of four-four techno and broken beats. It’s an achievement that she’s followed by being voted Best Of British 2018’s Best Producer. “I got propositioned,” laughs Rebekah on why she moved to Berlin in 2013, as we sit down in a North London Wetherspoons, the winter light fading outside. At 5’1”, she’s short, but has the presence of the techno world traveller, with dyed black hair and an all-black outfit. In what comes to sound like a previous life, she’d once lived in London at the start of the new Millennium, chasing the dream of being a DJ, but as it began fading away, she returned to Birmingham in 2004 with the acknowledgement that “I could get a three bedroom house with a garden and garage for literally the same price I was paying for a shared apartment in London.” Then, before she’d even sat down at a meeting she’d arranged with him there to put a name to a face, Michael Weicker from DJ agency Artist Alife, who was also CLR’s label manager, suggested that she move to Berlin. The catalyst had been her 2012 remix of Matador’s ‘Blond Slackers’, a six-minute groover filled with charged rave stabs and the profound influence of yet another iconic techno temple. It explains why the post-Soviet backdrop of Berlin, with its playground of giant abandoned buildings, was primed to become the new techno mecca, twinned with the sound that emerged after Detroit’s industrial collapse. With Regis, Tommy Four Seven and Alan Fitzpatrick helping pass her remix on to their peers, Chris Liebing, head of the industrially minded, Berlin-based CLR, asked Rebekah to record episode 170 of his CLR podcast in 2012. “It slowly moved into me sending him my music,” she says. “Then he said, maybe we’ll do an EP.” The offer to move to join CLR was initially daunting: Rebekah was in debt, working front of house at the Apple Store to pay these off. At the same time, however, Michael was offering her a place on the agency. “That was always my dream, to be part of a label and a crew. I DJ’d a long time on my own, and really wanted to have a home, to play with the same people and build something.” Within six weeks she was there, the reality sinking in that she didn’t really know anyone and hadn’t counted on the bitter cold that set in over the German winter. “It was never the right vocals for the crowd,” she retells on what had become an endless game of second-guessing, neither she nor the crowd ultimately ever satisfied. “They just wanted to hear the big anthems. I wasn’t willing to do it. Literally in the middle of my set, I lost all my heart and just said, ‘I’m not doing this anymore’.” Emotionally broken, for six years Rebekah carried on DJing, moving into minimal, tech-house then techno, but was still struggling to make headway. The shift finally came when she curbed partying, got a day job and just “let everything go. I didn’t care about DJing, I just made music. I let go of my control and it was really nice, because I just made music that I liked, rather than thinking about this label or that label.” Referencing the powerful lingering memories of her teenage moment of hearing techno for the first time, the sound that crystallised from her distilled creativity brought her to CLR. 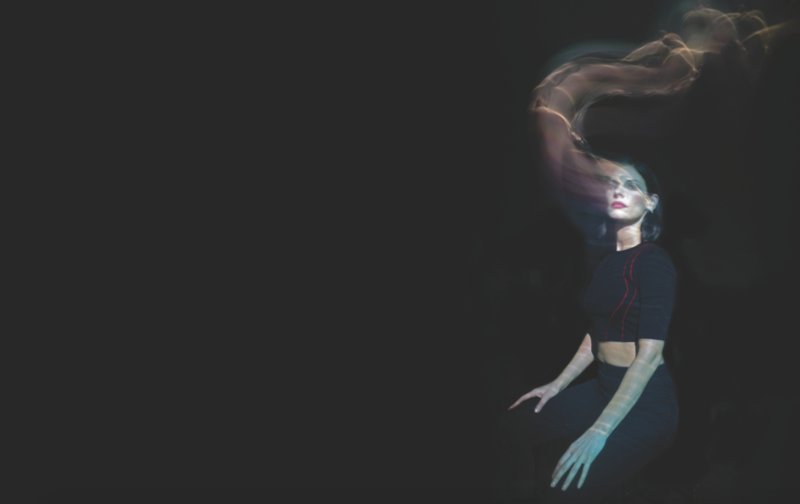 By putting CLR on hold to work on his own album, Liebing inadvertently laid the foundations of Rebekah’s too, as she channelled her emotions into music again. ‘Partying’, the modern day euphemism for the excesses that go on for hours, if not days, after the actual club has finished is something that Rebekah has spoken about before. Now sober for eight-and-a-half years, we accidentally discover a video interview with her from 2000, the year she mentions. Unrecognisable with short cropped hair, she shifts about on her seat with a nervous energy that has now gone, retelling a gig when she was so drunk supporting Brandon Block that someone labelled her ‘the female Brandon Block’. “My career was nowhere,” she says of the point when she decided to stop, feeling suddenly that the only place to go was up. “I was literally doing a gig here and there. I was really angry and jealous of everyone else. It’s a place lots of artists can find themselves in, if you’re not willing to take responsibility for where you’re at. How can I change? How can I get to a better place?” As with the break-up of CLR, what saved her was making music. Shortly before sobering up, she’d completed two years studying music production at Access Creative College Birmingham. It was another attempt to get on a track she was happy with, previous sessions working alongside more experienced producers never quite letting her articulate what she wanted. Still, “getting smashed every weekend” was putting the kibosh on any progress. It was almost impossible, by now, to separate the music she had once loved from the experience of peeking out the curtains on another sleepless Sunday, questioning everything. The course, combined with sobriety, gave Rebekah the discipline to finish music. “After two gigs DJing sober, I had the realisation I didn’t have to take drugs anymore. It was a light-bulb moment, and from then forward, it was complete freedom.” Having publicised her struggle, she’s sometimes contacted by those in a similar position, wondering, despite clearly considering stopping, if they will enjoy DJing without the lifestyle that’s sometimes sold alongside it. The clichéd ‘music is my drug’ is not a phrase that Rebekah utters, but it’s clear that once drugs were no longer her drugs, she finally began to thrive, as in the swirling energies that the extremities of techno offers. It was a return, she says, to the excitement of hearing Surgeon and Regis at their most noisy in the ’90s, of popping her head into Atomic Jam’s acid techno room to witness the relentless Stay Up Forever ethos of The Liberator Crew, or wandering shell-shocked around Midlands free parties, where gabber would be blasting out alongside the deeper, housier grooves of DIY Soundsystem. Her label Elements, which launched in 2014 with a trio of her own tracks, is her vision to further flesh out the spirit of this golden age in a modern context. Techno isn’t simply about the music, she believes, it’s also about a specific kind of venue and within that, a particular aesthetic style. 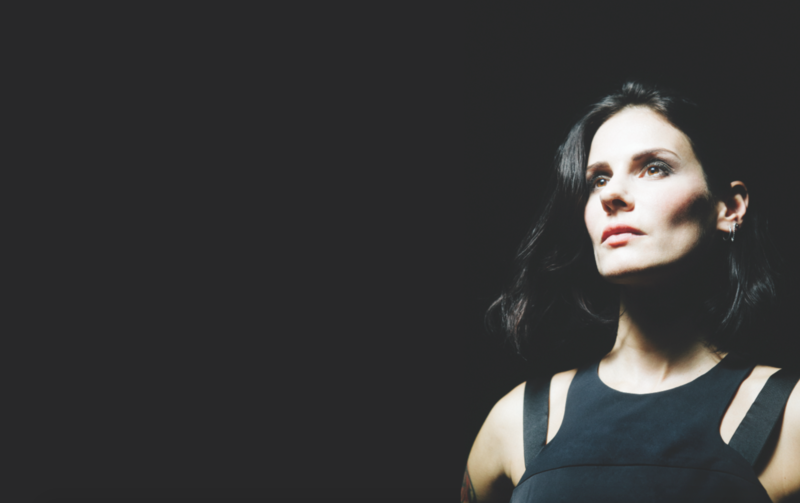 “For me, techno is about a dark basement or warehouse, it’s about minimal lighting,” she says. “When I was first going out in the ’90s, there were weird visuals, things that made you uncomfortable, because the music is quite sinister as well.” Finding herself often surrounded instead by beautiful, but incongruous, LED lighting displays, with Elements, she’s worked with Belgian artist Malika Maria to create a specific label look that draws on gothic horror (check the video to ‘Serrated’ on the label’s first release). With a dedication to pushing boundaries in the creation of this work, across still photography and video, Maria’s boyfriend was bitten three times when they involved a snake in one shoot. These visuals were used for the series of label parties which took place in Birmingham, the last of which was in March 2018, Rebekah joined by a line-up that included Ansome and Dark Chambers, the latter one of the people who she started out producing with. Her conclusion, however, has been that “the crowd is not necessarily there for this kind of techno” for now, with parties in the city that inspired so much of what she does on hold for now. If you want an example of the Dutch appetite, then head straight to the live streaming of Rebekah’s back-to-back set with Paula Temple from Awakenings at ADE in 2018. Describing it in the YouTube comments as “our full power rave set”, the pair deliver a hammering 140bpm ride through pounding drums, distorted bass and sinister leads building up to moments of release. It was the culmination of a series of back-to-back gigs in an alliance forged over a different kind of cardio workout: cross fit training. Having connected online around 2015, the pair had played on a few line-ups together. But when Temple, who also lived in Berlin, was going through some tough times, Rebekah suggested she join her at the cross fit class she was going to in 10 minutes. “It makes you feel really good, puts you in a good headspace where you can focus on music, and you get fit really quickly,” she enthuses, adding that she’s currently being hindered by an injury. Temple did, and so they became workout buddies. It was during one cool-down that the idea for playing back-to-back came about. Working as a model in the adult industry, starting out aged just 19, Rebekah naively thought nobody would see the work. It gave her time to concentrate on what she really loved, DJing, and she wasn’t the best candidate for a 9 to 5 anyway. “I always had to have Monday off,” she chuckles in retrospect. But it dogged her early career, with the feeling that she couldn’t be credible when she was just “another model that wants to DJ”. “It meant the second time around, I wanted my music to get to people before I did,” she says, reflecting that when she was younger, she had more expectation that things should just come her way, an attitude replaced now with gratitude for everything she’s achieved through hard work and focus. “Maybe that helped me to get my music out there.” Berlin’s famously open permissiveness also provided a welcome antidote to Britain’s more sniggering attitudes. “At the end of the day, the music speaks louder and travels further.” In her earlier career, she suffered further sexism. As an enthusiastic teen wanting to discover more about music, she’d asked for a job in a Birmingham record shop she still won’t name; the request went down like a “lead balloon”. Guiding their way is the elemental force that is Rebekah. Burning with the same undimmed passion that she had as a 17-year-old, as a DJ she’s out there exploring techno’s furthest shores, using her stature to aid those following in her wake. And as a producer, she’s showing that techno can be infused with a spectrum of emotion, no matter how hard it bangs.